Holding off a hard-charging Johnny Sauter and Brett Moffitt in the closing laps of a thrilling NASCAR Camping World Truck Series race, Kyle Busch claimed a milestone victory at his home track and kept alive the possibility of a three-race sweep at Las Vegas Motor Speedway. Busch crossed the finish line .437 seconds ahead of Sauter, who outdueled Moffitt for the runner-up position. Last week’s winner at Atlanta, Moffitt held the lead until contact of his No. 16 Toyota with the lapped truck of Michel Disdier gave Busch the opportunity to charge to the outside and pass for the top spot. Busch maintained the lead the rest of the way, except for two laps under caution for Disdier’s spin off Turn 4 on Lap 119. 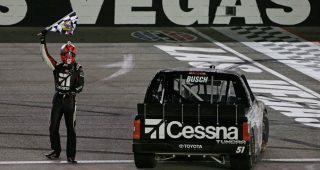 Busch won for the first time this season, the first time in a truck at Las Vegas and the 50th time in his career, leaving him one win short of the record held by NASCAR Hall of Famer Ron Hornaday Jr.
Busch has now won at LVMS in each of NASCAR’s top three touring series, and he has won a Truck Series race at every active track at which he has competed. “It means a lot,” said Busch, who will race in the NASCAR Xfinity Series on Saturday and the Monster Energy NASCAR Cup Series on Sunday. “We’ve had some great runs in the races that we’ve had at Kyle Busch Motorsports. We’ve raced and won all across the country, but I’ve just never been able to get back to Las Vegas to run a race. Failure to launch on the restarts cost Sauter a chance to battle for the victory after the final restart on Lap 124 of 134. Just not quite good enough for the driver of the No. 21 GMS Racing Chevrolet, who felt he could have caught the race winner given five or six more laps. Sauter, however, was no more frustrated than Moffitt, whose issue wasn’t with Disdier. Moffitt was seething because the lapped truck of Myatt Snider raced him tenaciously after coming off pit road with fresh tires in the late stages of the race. “When the 13 (Snider) pulled out from the pits a couple laps down and side drafted us for the lead, and it allowed Kyle to close in, I tried to go to the bottom of a lapped car (Disdier) and he turned down into us,” Moffitt said. Sauter added to his series lead, outpacing second-place Moffitt by 39 points. Fourth-place finisher Grant Enfinger is 40 points behind in third, one ahead of Noah Gragson, who ran 12th on Friday night. Stewart Friesen led 31 laps — second only to Busch’s 55 — and placed fifth. Gragson and Friesen won the first and second stages of the race, respectively.